Closed Monday Productions LLC presents the Art of Legacy exhibition at the newly renovated Old Georgetown Theater, a former silent movie house from the 1900s. The exhibition features Washington DC area artists, John Blee, Barbara Januszkiewicz, Anne Marchand, Martha Spak and photographers Marissa White and Matt Leedham. Recently added to the exhibition, sculptor Raymond Kaskey and his famous sculpture Portlandia. The Pop up exhibition will be on view from March 9-26, 2017. A reception “meet the artist” will be held on Sunday, March 19, 2017, from 5-7 pm at the newly renovated space located at 1351 Wisconsin Avenue NW in Washington DC, Georgetown. All artists will be available to meet and discuss their artwork. “The Art of Legacy exhibition has successfully enhanced this exquisite newly renovated space featuring natural light and views of the unique outside garden. Curating the current show has reminded me of the importance of art in the community and why it matters.” says Marsha Ralls, “It’s a perfect meeting of historic DC with artists whose work reflects the very nature of the city.” Ralls, the curator and CEO of Closed Monday Productions, worked closely with architect Robert Bell to create a showcase for some of her favorite artists. To receive more information, or to attend the reception on March 19, please call (202) 450-7825 or email closedmondayproductions @gmail.com Interviews and images available upon request. The gallery hours will be 12 PM until 5 PM March 10th through March 26th or by appointment. Opening Reception: Wednesday, March 8, 6-8 p.m. Welcome to the exhibition of the Hill Rag’s Art and the City “REvisit” artists. For the 14th year of my column, Art and the City, I elected to look back at some of the artists I had profiled in years past. I was looking for contrasts—for the creative journeys that bring new directions and new perceptions. What I found was dedication – a fervid reaching for excellence and evolving insights that let them soar higher, while ever-testing and questioning the meaning of it all. For all of these artists, the intervening years have been full of art – full of seeing, searching, and living visually. By being creative, they have given true value to time. To the reaching and lifting river photography of Bruce McNeil. Yes, the works are for sale…too often underpriced in my opinion – with 30% going to the support of Hill Center. I’ve been writing the Hill Rag column, Art and the City, since March 2002—14 years. I am an artist and writer. My book, A Haunting Beauty: Vietnam Through the Eyes of an Artist, has received awards and great reviews. I have had a presence on Capitol Hill for 40 years in one capacity or another and have a fair number of paintings in personal collections scattered about the area. I have also been a legislative assistant to a US senator and a teacher of kids with emotional disabilities. The former prepared me for the latter. This show is generously sponsored by the Hill Rag. 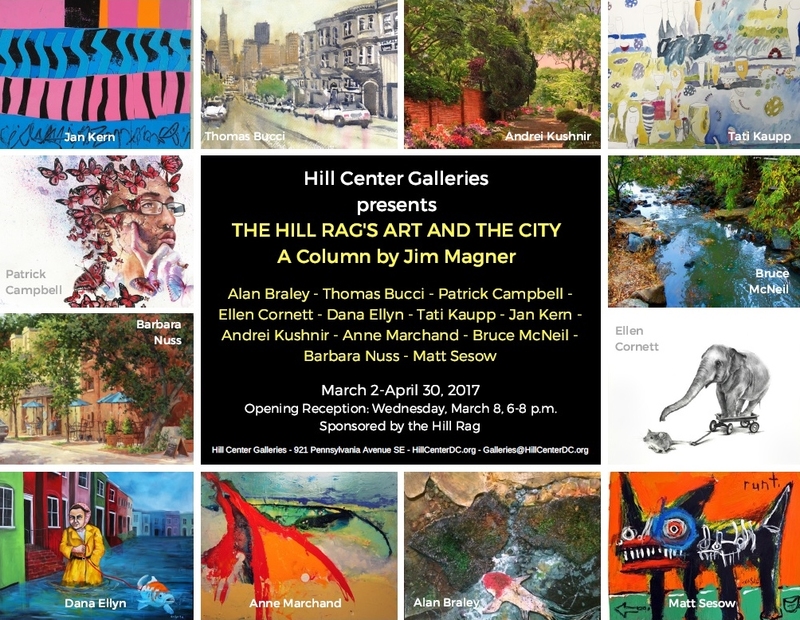 The Hill Rag's Art and the City Exhibition Opening is March 8! The Art of Legacy Exhibit, in the historic former space of the Georgetown Theater 1351 Wisconsin Ave NW, Washington, DC. Sponsored by Marsha Ralls Founder & CEO of Closed Monday Productions LLC along with architect Robert Bell. Cocktail reception Thursday, March 9 from 6 and 8 PM. Hours are 12 noon until 5 PM or by appointment March 9th- March 19, 2017. See https://www.facebook.com/events/1050411408417740/ for more info. Closed Monday Productions LLC presents the Art of Legacy exhibition at the newly renovated Old Georgetown Theater, a former silent movie house from the 1900s.The exhibition features Washington DC artists, John Blee, Barbara Januszkiewicz, Anne Marchard, and photographers Tom Wolff, Marissa White and Matt Leedham. The Pop up exhibition will be on view from March 9-19, 2017. An opening reception will be held on Thursday, March 9, 2017, from 6-8 pm at the newly renovated space located at 1351 Wisconsin Avenue NW in Washington DC, Georgetown. “I’m delighted to welcome spring with these iconic DC artists and photographers, and share their work in this historic space that has been lovingly restored,” says Martha Ralls, “It’s a perfect meeting of historic DC with artists whose work reflects the very nature of the city.” Ralls, the curator and CEO of Closed Monday Productions, worked closely with architect Richard Bell to create a showcase for some of her favorite artists.